Lipomas are soft, painless, flesh-colored lumps found on almost any part of the body. They are caused by collections of fatty cells in the subcutaneous layer of the skin. They may arise as single or multiple lesions. While most lipomas are small (less than 5 cm), some may be very large. Extremely large lipomas may raise suspicion for mimics such as liposarcoma. Lipomas can occur at any age,although they are most commonly observed in the middle years of life. Most lipomas are slow growing lesions with little change in size noted over the years . Lipomas tend to have a soft, rubbery feel and are usually mobile (i.e. move freely under the skin). While most do not cause issues, some lipomas may cause local irritation: e.g. 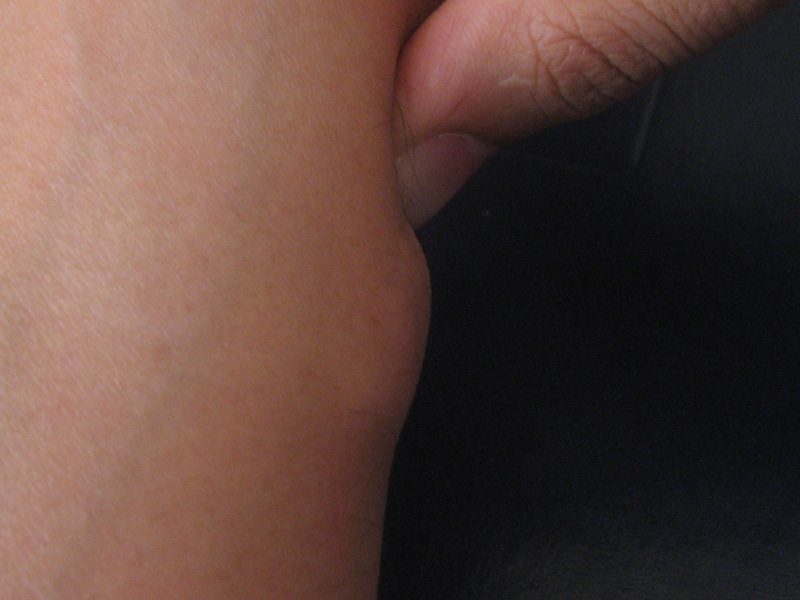 the presence of a lipoma at a flexural region such as the folds of the arm or neck may cause frequent rubbing and subsequent irritation and discomfort . No one quite knows why you get lipomas. There seems to be a genetic component to developing lipomas, meaning that you are more likely to have them if you have blood relations who do. Some lipomas may be aggravated by minor injuries too. Less commonly, there are inherited conditions like familial lipoma syndrome, Gardner’s symdrome or Dercum’s disease that can cause large numbers of lipomas to develop in affected individuals. Lipomas are benign lesions. They are not cancerous or harmful to the individual. They may, however, cause localised irritation and discomfort, particularly when found in flexural regions or areas of the skin prone to frequent motion/rubbing. Rarely, a cancerous lesion known as liposarcomas may resemble a lipoma. Unlike lipomas however, liposarcomas tend to grow rapidly, are fixed (don’t move easily under the skin), and are usually painful. For the large part, lipomas can be left safely alone. However you should consult a doctor if you note any unusual activity in your lesion ( e.g. rapid growth, persistent pain, fixation of previously mobile lesion etc). If necessary, your doctor may recommend a biopsy of the lesion or imaging such as Magnetic Resonance Imaging (MRI) to rule out liposarcomas or other malignant lesions. You may also wish to consult a doctor if you are keen for removal of the lipoma, either for cosmetic reasons or for relief of localised irritation. Lipomas may be treated conservatively with steroid injections; however results are usually unsatisfactory. The best treatment approach is removal of the lump. While liposuction is possible, the far preferred technique is surgical excision. This can usually be done safely and quickly in the GP setting. Under local anaesthesia, the lesion can either be excised completely or removed in a segmental fashion. The incision wound is closed by suturing, with removal of the sutures done at a separate setting. Even with complete excision of the lesion there may be a small chance of recurrence. However such recurrences generally tend to start small and progress very slowly so you may still benefit from removal. Occasionally, very large lipomas or lipomas in certain regions such as the neck may need to be removed in an operative setting , often with general anaesthesia. In these circumstances, you may be referred to a surgeon to review and prepare for the surgical removal. Most lesions can still be done as a day surgery and you should be able to return to work soon after. Will it impede my movement as it is near the left hip joint? Thanks! For Lipoma of such size at such location, it is best to consult a general surgeon. Do you guys remove bony lumps (believe they’re called osteomas) on the forehead? Unfortunately, we do not remove osteomas. However, you should get the diagnosis right first. Please see a doctor to get a proper assessment and scan if required. It is difficult to assess what the bumps are without looking at them. If you are concerned, you should seek further evaluation from a doctor. I had went to normal clinic and doctor suspect the lump (about 2cm)on my forehead is lipoma. May i know if to have it remove will leave scar? Do clinic provide Endoscopic Removal treatment? How much of the cost? Lipoma removal will definitely leave a scar. We do not provide endoscopic removal treatment. For lipoma removal cost, please call 62350338. Or you can CLICK HERE to contact us. 5 year old kid with a cyst(fatty tissue）at birth. Estimate size of the lump on forehead is 10mm by 6mm. For cosmetic reasons, we would like to have it removed. Can i know if you have handled such cases for kids this age before and is it advisable since they need to go under anaesthesia correct? I suggest you bring him to see a paediatrician specialist for this issue. Sir I have these lipomas through out my body more than 15-20 and I wanted to get under go a biopsy test to rule out further issues . Could you please let me know how much it costs . I have an employment insurance will it cover under that ? Hi there. For pricing, we will drop you an email. You will have to check with your insurance company if it covers. I have a small cyst on face, I already check with doctor..I want to know how much to remove it? Hi Sabbir Ahamed. I believed I have already removed your cyst last week. Thank you. I have a epidermoid cyst on my head covered by hair. It is around 3 cm in diameter and 1 cm in height. How much would be the cost of excision? Thank you. Excision of a cyst is $400-$500. Consultation is $45. It is best to let us assess your cyst to advise you better. I have multiple lipomasclerosis total body around 100 can you have treatment how much cost? Removal of 100 lipomas is not safe for you. You may want to choose to get some removed, one step at a time. Removal of one lipoma is approximately $400 – $600 depending on the complexity. Hi, I have a 10cm lipoma on my left shoulder, on my shoulder blade. Can it be removed at your clinic or must it be done at a theatre? Can I find out the total cost involved? 10 cm is a significant size. This would require a signicant amount of local anaesthetic hence it is best removed in a hospital setting in theatre. I have a 1.5cm lipoma on the shoulder. Near the bone. Is it necessary to do it in Operation theatre? What is the difference between doing the procedure in hospital and in clinic? It is best to see a doctor to get your lump assessed first. A small lipoma can usually be removed under local anaesthesia in a clinic. It is best to book an appointment for lump removal in order for the procedure to be done on the same day. Email us at doctor@drtanandpartners.com or call us at 66942348 to arrange an appointment. Hi my maid has a lipoma at her neck and wants to get it removed. The insurer said she is covered if she goes for day surgery . May I know how long is the day surgery and how much does it cost? Do we need to come for consultation first? I have a referral letter from Bedok Polyclinic. Please advise and thanks. Procedure takes about 30-60 minutes depending on the complexity. It is best to come in to let us take a look at the lipoma. I believe you have made an appointment with us. See you soon. I have a slighter bigger than 5cm rounded lipoma (if I’m not wrong) at my shoulder blade and has been growing recently. DO I have to go through day surgery or just a normal anaesthetic? And what are thw estimate cost? Is it medisave claimable as well? Hi there. It only requires local anaesthesia. Procedure can be done in our clinic. It is best to come in to let us assess the lump and discuss further. Cost is estimated to be around $300-$400. It is not medisave claimable. I have a 2cm lipoma under my chin. I would like to know the cost of removal and how does the procedure will be carried out? Hi there. Lipoma is removed with minor surgical excision. Cost of lipoma removal is $300-$400 depending on the complexity. Consultation is $35-45. I have about 7 lipoma in my arms. I intend to remove some, especially those large deep-in and visible types. Please advise what the cost is and does the surgery covered by insurance? You need to check with your insurance company if lipoma removal is covered. Every insurance cover is different. I have a 2cm lipoma on my arms. may i know if to have it remove will leave scar. Is it going to be a clinic procedure or if we have to be done at the operation theatre in teh hospital? Every surgical procedure comes with a risk of scarring, bleeding and infection. It will be very unethical for us or any doctor to promise you a scar free surgery. A small lipoma can easily be removed in a clinic. You do not need to go to a hospital. I think I have several (about 15) at various parts of body. But 2 on my arms are more obvious and protruding. I will like to know the cost of removal these 2. They are about size of 20 cent coin. Removal of lipoma is from $200 per lesion, depending on the size and complexity. You are welcomed to visit us to get them assessed to discuss further.